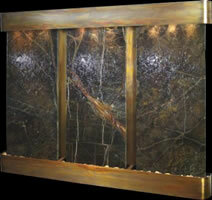 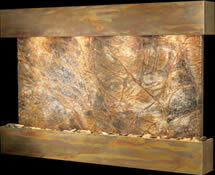 Indoor Marble Wall Mounted Hanging Water Fountains and Water Walls"
Our solid marble wall fountains feature contemporary stainless steel, rustic copper, and new antique blackened copper frames. 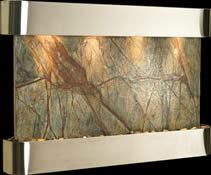 Marble color options include; Rain Forest Brown, Rain Forest Green and Black Spider marble. 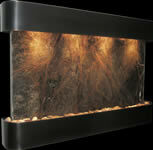 As beautiful as they are impressive these fountains add visual drama to any room creating a focal point that adds grace, luxury and interest.